oh I love this! little mole's house entrance! and that acorn being carried... priceless! Oh Sweet Jersey Moses! Those knit caps are painfully cute! TOOOoooooooo ADORABLE! the black and white striped knit on the bird came from you! 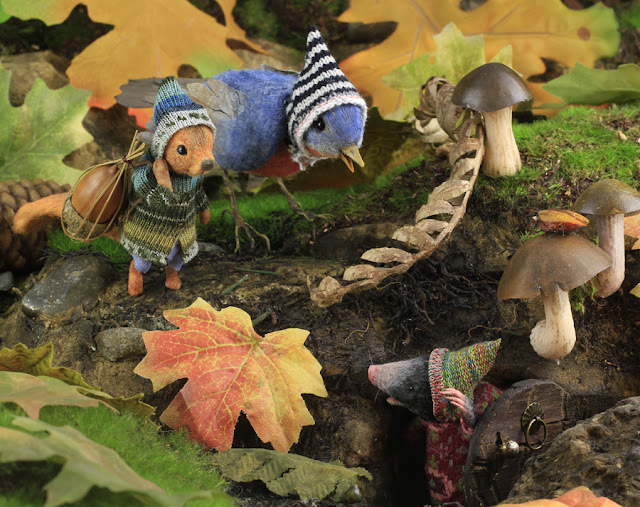 I can feel the chill where I live, but I'm glad that the little woodland creatures know how to stay warm in the winter. ...and the bird has a hat! LOL oh my goodness!